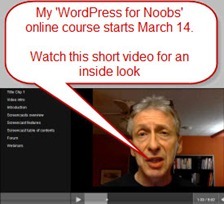 I’m nearing the end of teaching my first online course, WordPress for Noobs. It’s gone well so I’m offering it again, starting March 14. 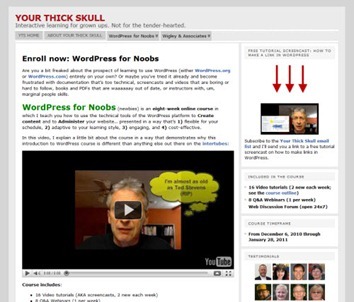 I’ve revamped the WordPress for Noobs course introduction screencast. When I created the first one, the course didn’t exist. I’m now able to take you behind the scenes to show how the course actually works. I’ve updated the Noobs Course Outline page to more accurately reflect what actually has happened. I’ve added a column for weeks (Week 1, Week 2, etc) to show what gets delivered and when. The fee for the course remains $97 but it goes up on March 8 to $122. WordPress for Noobs starts soon. Get it through Your Thick Skull.